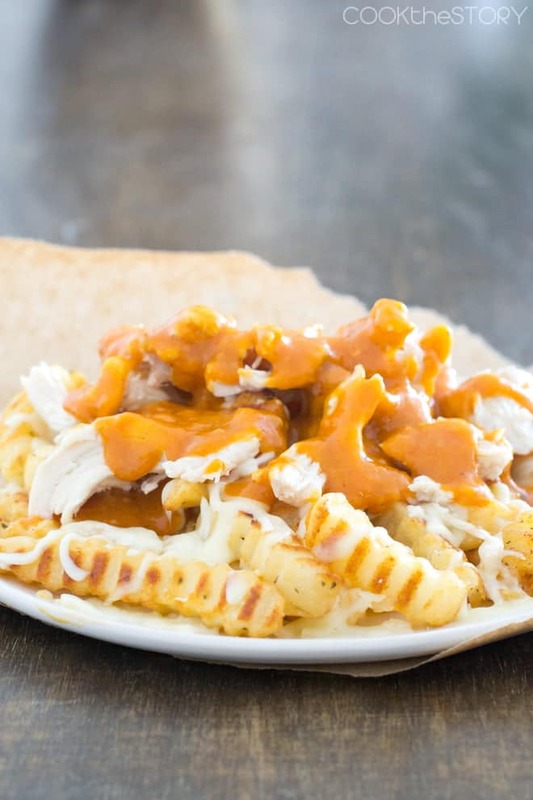 Today we’re taking Quebec’s famous french fry dish, Poutine, to a whole new level — a cheesy spicy buffalo chicken level. This recipe is sponsored by the U. S. Potato Board. Have you had poutine before? If not, you’ve got to try it. Now. It’s a dish from Quebec, Canada but it’s become trendy all over North America recently. You’ll find it on the menu in fancy restaurants all over the place. And it has of course shown up on a lot of food blogs. 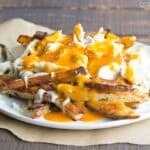 In fact, one of my favorite websites, Serious Eats, recently posted a quick poutine recipe here and a much more elaborate one over here (complete with homemade cheese curds!). My poutine recipe today isn’t as elaborate as that one but it does take poutine to a whole new place. A Buffalo Chicken place. How did this come about, you ask? Well, the U.S. Potato Board asked me to develop a recipe featuring potatoes. I immediately wanted to do something with fries, but I wanted to make the fries more interesting than normal. I seized on the idea of sprinkling fry-cut potatoes with ranch seasoning powder. This gives the fries a great flavor but also helps them brown in a shorter amount of time than usual. Score! Once I had the ranch fries down I started thinking about what goes with ranch dressing. The obvious answer is Buffalo Chicken Wings. (I know, some people like blue cheese with their wings. I’ve never been one of those people. For me it’s all about the ranch). 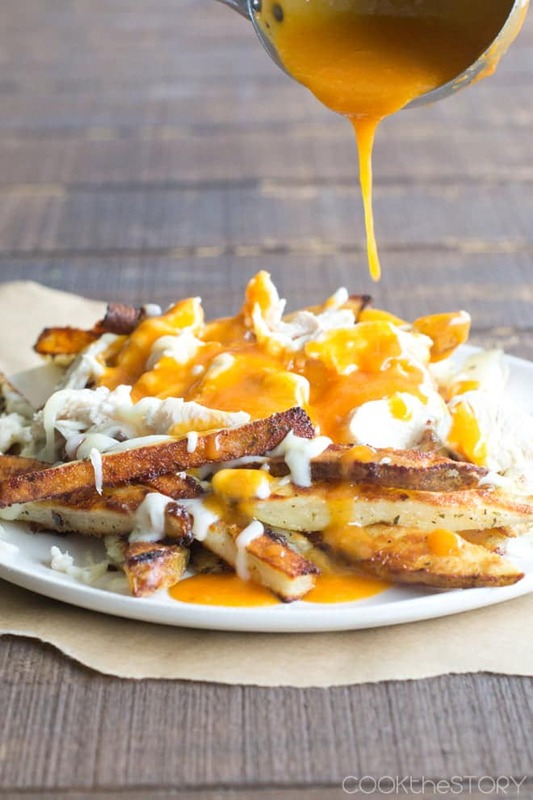 Buffalo Chicken Poutine was born. Pin it to your Cheese Board! You’ve got the ranch fries. Then you top them with lots of shredded mozzarella cheese and cooked chicken (I used rotisserie chicken but any kind will do). As the finishing touch, everything gets doused in an incredible gravy made with butter, wing sauce, and beer. Just look at that sauce! 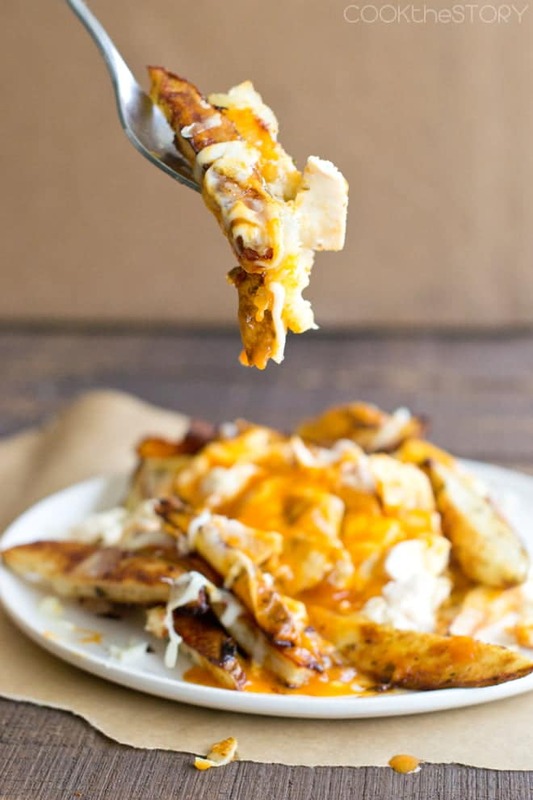 The cheese sandwiched between the hot fries and hot sauce melts, making this a gooey, spicy, cheesy, potato feast. Quick note: Please make sure you use Buffalo Wing Sauce in this recipe and NOT hot sauce. These are different things and the result of that mistake could be a disaster. Here’s info about the difference between wing sauce and hot sauce. If you don’t want to make home-made oven fries, you can absolutely use store-bought frozen fries. Frozen potatoes, like frozen french fries, are such a convenient option. I always have a bag of fries in the freezer just in case I’m in a hurry. Here’s how the poutine looks when made with delicious crinkle cut fries. Oh geez. I just had an amazing idea. What if you used curly fries? Or thick cut potato wedges? Or…wait for it…tater tots! Hitting the frozen aisle is a great way to take this poutine to a whole new, and convenient, level! To use frozen fries (or frozen tater tots, or wedges), cook them as directed on the package. Then sprinkle with 2 tablespoons of the ranch seasoning powder and toss them a bit to coat. Everything else about the recipe is exactly the same as listed below. 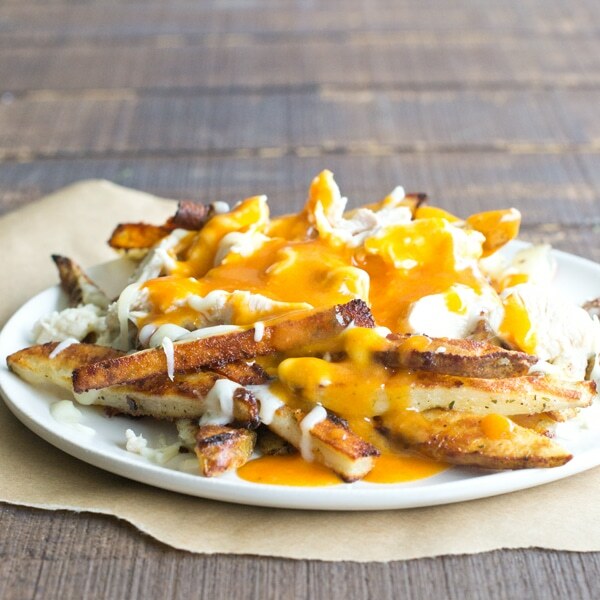 Take poutine to a whole new level with ooey gooey spicy Buffalo Chicken Poutine. There's a ranch seasoning on the fries that adds a bit of flavor but also helps the fries brown more quickly. And there's the most delicious beer, butter and wing sauce gravy. You're going to love this dish. I just know it! Note: You can use store-bought frozen fries in place of the fresh potatoes called for below. Simply cook the fries according to the package directions and then toss them with 2 tablespoons of the ranch seasoning mix. The rest of the recipe is the same. Cut the potatoes into 1/4-1/2-inch strips. Put in a large bowl with the oil and 2 tablespoons of the ranch seasoning mix. Toss to coat. Transfer to a large baking sheet making sure no fries are overlapping. Put into the oven even if it has not yet finished preheating. Cook for 15 minutes. Use a metal spatula to scrape under fries and flip them. Cook for another 10 minutes. Sprinkle fries with remaining ranch seasoning. While the fries cook, melt the butter in a medium saucepan over low heat. Whisk in the flour. While whisking constantly, slowly drizzle in the beer. Make sure it's smooth. Continue to whisk as you add the wing sauce and then the broth. Add the salt and pepper. Increase heat to medium and stir frequently until it reaches a simmer. Reduce heat to low and stir occasionally until the fries are ready. Taste and add more salt and pepper if desired. Just before the fries are ready, put the chicken on a microwave-safe plate and heat in the microwave until very hot, 1-2 minutes. Assemble the poutine by dividing the fries among 4 plates. 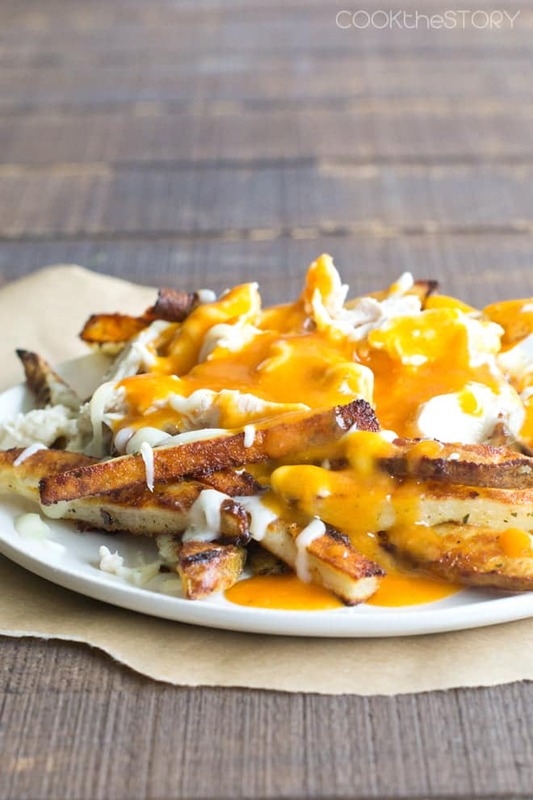 Top each serving of fries with 1/2 cup cheese and 1/2 cup chicken and 1/3 cup of the beer sauce. Let sit for 30 seconds to allow the hot fries and sauce to melt the cheese. (Note that you will have sauce leftover. Cover and refrigerate so that you have an excuse to make more poutine tomorrow!). Disclosure: This blog post and recipe are sponsored by the US Potato Board. They have compensated me for the ingredients and for my time. In addition, this recipe and blog post enter me into a blogger contest that the Potato Board is having where I could win a trip to a conference. 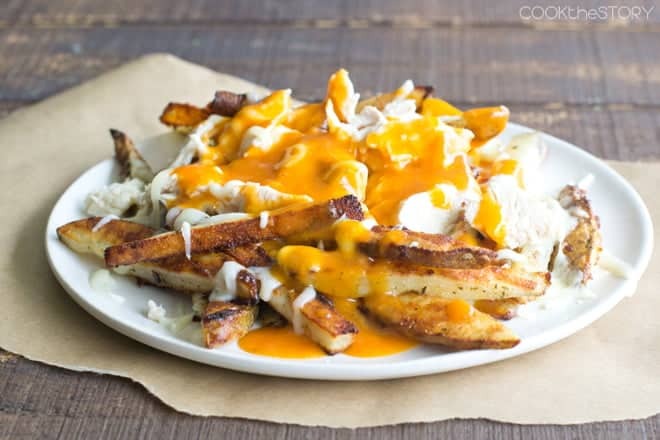 Replace shredded mozzarella cheese with proper poutine curd cheese! Shredded cheese is an INSULT to this dish! It was delicious and easy to make. I added jalapeños, green onion and tomatoes. Sad I ran out of fries ? I have only heard good things about poutine. People who have tried it, loved it. This version looks incredible…a plateful of a whole lot of flavor! Let me try this again! This is truly brilliant! My guys would flip out for it! This looks SO yummy! I am obsessed with buffalo wings – Pinned!!! Oh MY!! This looks outrageously good, Christine!